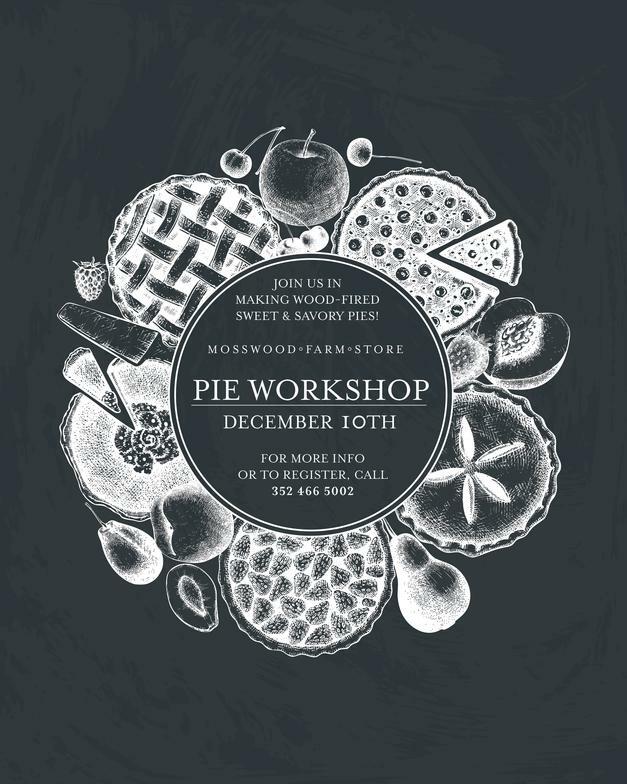 Join us, Saturday, December 10, 2016, from 10 am to 4 pm for a day of wood fired pie baking. Together we will work the oven, create the perfect (all butter) flaky crust and craft one sweet and one savory pie. We will be using organic pastry flour for our crust and we will share some helpful pointers for working with pie dough in warm temperatures. While the pies are baking each participant will decorate custom pie boxes. While providing a firm foundation to work from, this workshop will encompass a brief overview of several decorative approaches to pie decoration. You will walk away with one sweet pie and one savory pie, a folder of recipes and tips, and a printed pie box. Micanopy, Florida. We are located approx. 9 miles south of Gainesville, just a few blocks from Highway 441 and Interstate 75. The bakery is intimate and rustic so expect to be cozy with your classmates and be prepared to work outdoors as we will be working with an outdoor wood-fired oven. Class size is limited to 10. You will need your own water bottle and apron. Our space is not gluten free, nor is any of the snacks we provide. All attendees must be pre-registered. The cost is $95 to reserve your spot. You may pay by cash, check or charge in person or by calling Mosswood Farm Store at 352-466-5002. Registration ends December 3rd or when class fills, whichever comes first. If you need to cancel, a 100% refund will be provided provided we receive the cancellation notice no later than Wednesday, December 7, 2016, by 6 pm. Late cancellations will not receive a refund. *We will have some extra supplies/utensils but don’t have enough for everyone.